The relief rally for the Nifty that began from the lows of February 11th, ended today with a strong reversal bar. As can be seen from the chart below, today's price action shows a rejection of the early highs and sellers have overpowered the buying pressure of the previous day too. This bearish outside day is marked on the chart. 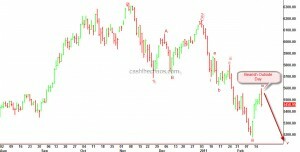 If my Elliott wave labelling is correct, Nifty should decline to a minimum of 5115 in the near term - could be even as quick as 2 weeks or less. Hi Jai, Really impressed with your projection in the past though nifty pushed itself up all the way to 5600. Now should we square off all our cash holding too and start buying puts of March. Your response will be highly appreciated. Thanks in advance. For the vast majority of stocks that is going to be the case. Even for the other stocks, it may just be a matter of time. If someone has been long and holding since March/Apr 09 and still has some cushion of profits, holding till break of Feb 11th low may make some sense. Puts of March would be quite sensible. Thank you. More importantly, hope it was meaningful to your portfolio and kept you on the right side of the market. Once again you have proved to be absolutely on the dot on Nifty. Congratulations Sir ! You had mentioned about the levels in Bank Nifty also but I did not initiate any short positions in them. Totally my loss. I came to know about you sometime back but I did not pay much attention at that time. I sorely regret this. Sir, I know you have said earlier that counter-trend moves are difficult to predict but you have been right in the counter-trend moves also. It is amazing. Now please I request you to inform the level that the nifty can bounce back to so that I can initiate shorts again. Also please indicate what the stops, if any, should be and what targets to look for to book profits. To me the decline looks incomplete and it has to exceed the low of Feb 11th and do a minimum of 5115 with possibilities of 4816-4779. On the higher side, the high of Feb expiration day should act as a strong resistance, though I suspect the market may not even cross 5372. Look at some just OTM puts on a pop on Monday if you are trying to create fresh short position on Nifty. I still think the dominant trend is lower. 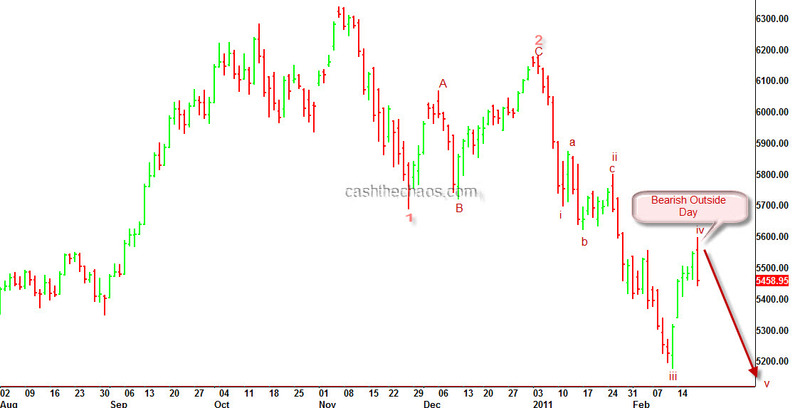 Nifty could stay up for a couple of days and then head back in the direction of the dominant trend. Unless Nifty crosses 5690, there will not be any need to re-assess my views. hello Sir, Bought nifty 5200 Put @70 AVE. Shouldhold or exit as it seems nifty heading for 5600 and Beyond. You are the best judge of whether to hold or fold . Having gone for puts you have already limited your risk. Here is a broad hint – suppose I was in this trade, I would not worry about what the market does in the extreme short term. Before pulling the trigger on a trade, I would have already evaluated how much I can afford to lose if I get the trade wrong. I’m sure you have done this too. Now, here is the technicals – my reading is that markets are still in a down trend and nothing much has changed. The markets may extend higher for a couple of days and then will resume the trend lower. I am not a technical person but I do have some limited experience in this market. I would like to share some of my views here. Jai, please do comment as it will provide a learning experience for us all. “The Long term trend is down, the intermediate trend is down, only the extreme short term has trended up but again that is event based and does not mean that the scenario has changed. Am I right? In fact even if I were to be holding shorts in futures, I would be comfortable paying additional margins and holding on, possibly adding some more in a pyramid structure and cashing in, as soon as the trend resumes downward again. All trades should have a stop loss, that is true, and one should get into a trade assessing one’s loss limit, that way and only in that way would one be able to make money in this market. Am grateful for your adept response. will hold with SL of 5700 spot. Further to the point about stoplosses, I believe the stoploss will have to be on closing basis. Any intraday movement should be discounted, I think, because of the high volatility. What say? Dear Jai, pls post your upcoming schedule on T.V. As its very interesting to watch. Elliot Wave Principle – by Prechter and Frost is a classic and advanced book on TA. But remember, learning to NOT bring in a bias and keeping things simple will work wonders. In my experience that is much more important. A suggestion. I think a seperate discussion board might be more helpful here. Keep these stock on your watchlist So much for the Reliance-BP deal! !